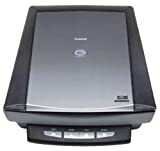 The CanoScan 8000F USB flatbed scanner offers resolutions up to 2,400 x 4,800 dpi--four times greater than 1,200 x 2,400 scanners--for images with fine detail that maintain their quality when enlarged. Results are made even more spectacular with 48-bit color depth processing, resulting in over 281 trillion possible shades (in/out). The 8000F's scanning speed is impressive, thanks to the Hi-Speed USB 2.0 interface--up to 2.5 times faster than USB 1.1, making the this scanner ideal for handling complex images. To quickly and conveniently add negatives or slides to any project, a built-in 35mm film adapter scans up to 12 negative frames or 4 mounted slides at a time. This scanner is backed by a one-year warranty with InstantExchange service.